We really, really like Star Trek, and seem to spend a not-insignificant portion of our time talking about it anyway. Plus a lot of the other podcasts out there do not have three ladies talking loudly about Star Trek at great length, have you noticed? Corene has vague memories of watching original series Star Trek in black and white television in a farmhouse in the middle of nowhere. As a youth, she read every single Star Trek novel available in Northern Alberta long before watching a single episode sans diaper. She has an eye for catching tennis outfits on screen (Seriously Kim. How did you miss this? It’s right there in “Where No Man Has Gone Before” in the opening scene in the lounge. Can’t miss it. BRIGHT PINK.) and enjoys a good space battle or clunky fascist metaphor. Janeway was her first captain but James T (the t stands for “the stack of books with legs” ) Kirk is the captain of her heart. Kim is not on Twitter. Our… let’s call it a coat of arms. 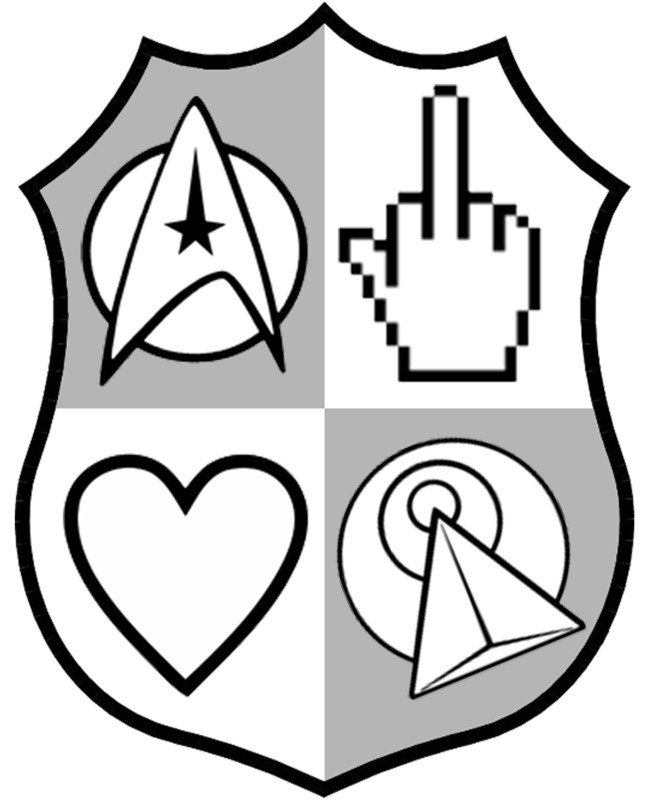 Starfleet Insignia (Jean-Luc Picard): While not everything in Star Trek is about Starfleet, one can’t deny that Starfleet serves as the in for most of the stories set within the Trek franchise. Starfleet’s symbol has changed a lot over the years, but it always involves the distinctive arrow shape, as though pointing us forwards. IDIC (James Kirk): Infinite Diversity in Infinite Combinations. 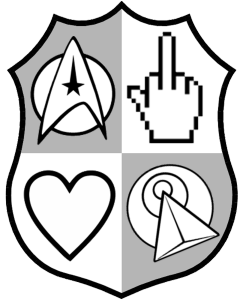 A motto for life, and also the most poignant symbol of the founding principles of the United Federation of Planets.